Staples, yes you all know that how big the store is! You can purchase office machines, desk organizers huge variety of stationery, planners, folders and many more things. So if you are working at office or school or college definitely you need any of above mention things so don’t wait just go and purchase things which you need at the very low price and save money. If you can’t go to the store then reserve your desired product online. 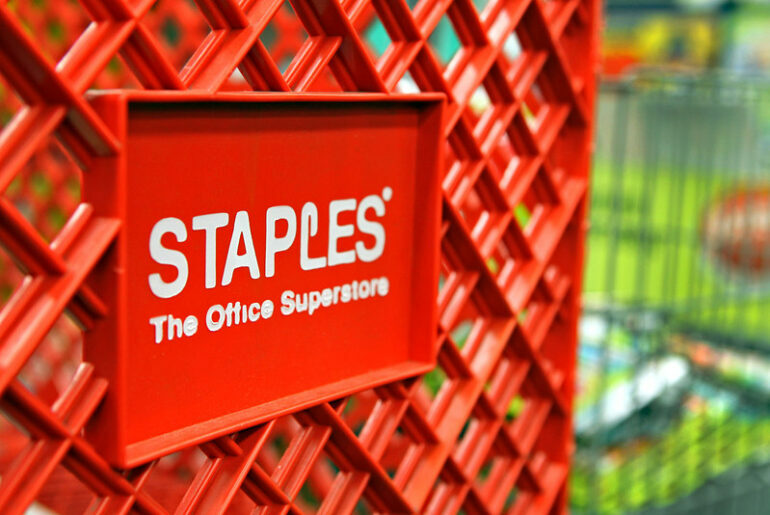 Staples bring an ease for you. Avail and enjoy great deals with Staple. Staple will give you a great experience. Here some deals are mention below. Wow! 50% off on Avery Labels. Get your product in $12.99- $29.99. Staple will give you another one at half price. So bring two products at fewer prices. Enjoy purchasing with staples and small and convenient items for your tasks at your home and in the office. Two posts it and scotch products in $24.49. No! Now you can get two products in just $ 20. You have a limited time offer, so go the store and purchase it. Enjoy purchasing with staples and bring colorful items to your home. Oh, amazing discount electric pencil sharpener. Give ease to your kid. Staple will give you an easy way to purchase your desired products. In $19.99, no get it in just $ 15. Save $4.99 and bring a smile to the face of your kid. Get an HP laptop with Intel Core i3 processor in just $39999. You will save $ 130.it has a window 10, 17.3 HD screen, 8GB RAM, 1 TB hard drive. So what are you waiting for? Avail this limited offer and get a free support from Staples regarding the installation of any hardware or software. Enjoy deals with Staples. Get a LED monitor in just $12999. You will save up to $ 150.It has a full HD screen with 1920 x 1080 resolution, and have VGA and HDMI inputs. So what are you waiting for? Avail this amazing limited offer. Make your home luxurious and watch your favorite shows on big screen. And get a free support from Staples regarding the installation of any hardware or software. Enjoy deals with Staples. Get 32 GB flash drive in just $1699 instead of $39.99.you can save up to $23. Wow isn’t it an amazing deal! Of course, it is. Get 64 GB flash drive in $1999 instead of $49.99 save upto$30. You can get 128 GB in just $3999 instead of $69.99. Save up to $ 30. Wow, deals. Get up and avail these deals. If you are a gamer bring this chair. Oops! No bring this comfort and enjoy your game. Get this new chair with the new design in just $129.99 $199.99. It is a good offer to enjoy in fewer amounts and save up to $ 50.It is available in 2 colors, red and blue. Avail the offer and enjoy the leisure time.